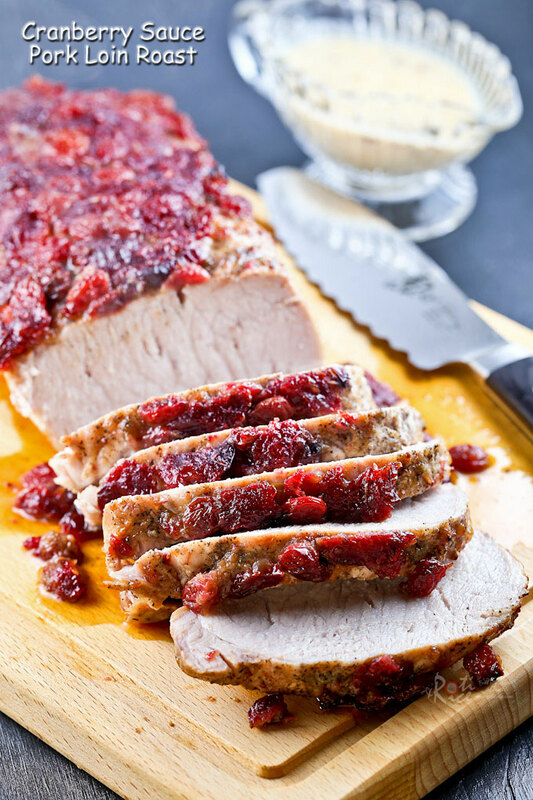 If you are like me and have leftover homemade Cranberry Sauce in the freezer, then you will want to make this Cranberry Sauce Pork Loin Roast. It is amazingly juicy and it feeds a crowd. Best of all it is very easy to prepare. In the past, I would usually do a pot roast with pork loin but that takes time. I recently discovered that I can half the cooking time by roasting it in a grill pan. It will be just as moist and tender if you get it right. It takes approximately 50 minutes to roast a 3 pounds pork loin to an internal temperature of 150˚F (65˚C). While it is roasting, prepare the Creamy Dijon Mustard Sauce and whatever side dishes you wish to serve with it. I like to serve mine with steamed vegetables and Whole Baked Sweet Potatoes which can go into the same oven as the roast. 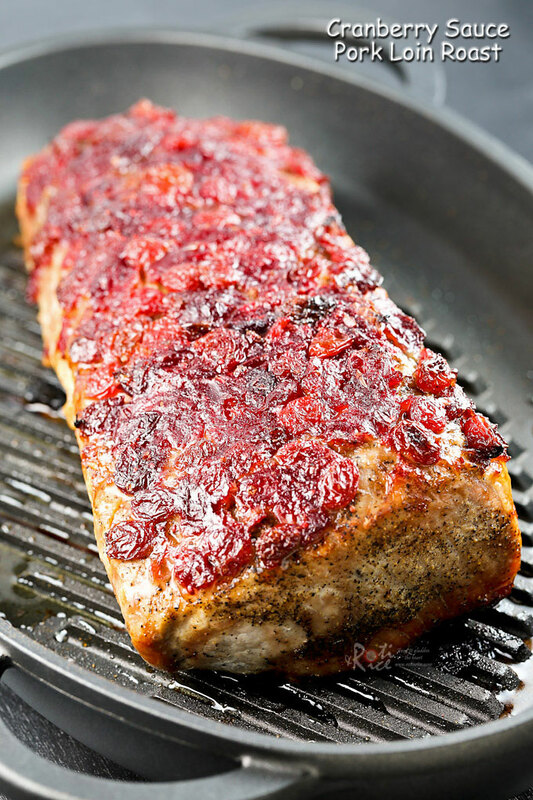 It is important to sear the top and bottom of the pork loin to keep the juices inside. Then spread the cranberry sauce on the top like a crust to prevent it from drying out in the oven. Sprinkle 1 teaspoon salt and ½ teaspoon ground pepper all over pork loin. Brush grill pan with vegetable oil. Sear pork loin about 3 to 4 minutes on each side. 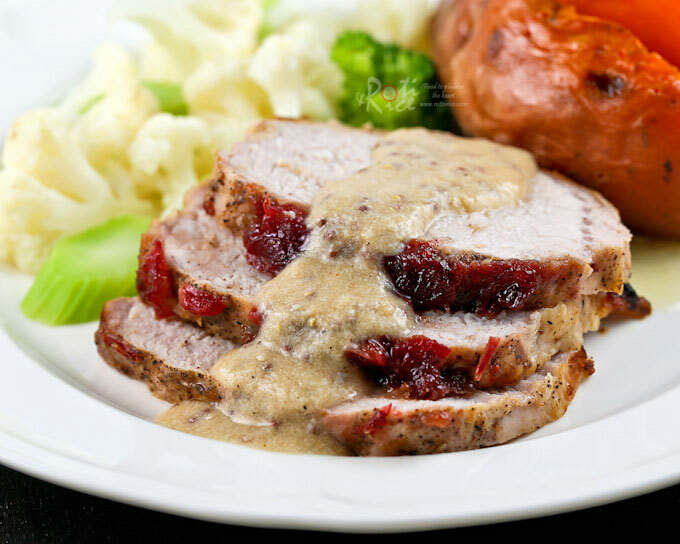 Pat cranberry sauce evenly over the top of pork loin. Transfer to preheated oven and roast for 50 minutes or until internal temperature is about 150˚F (65˚C). 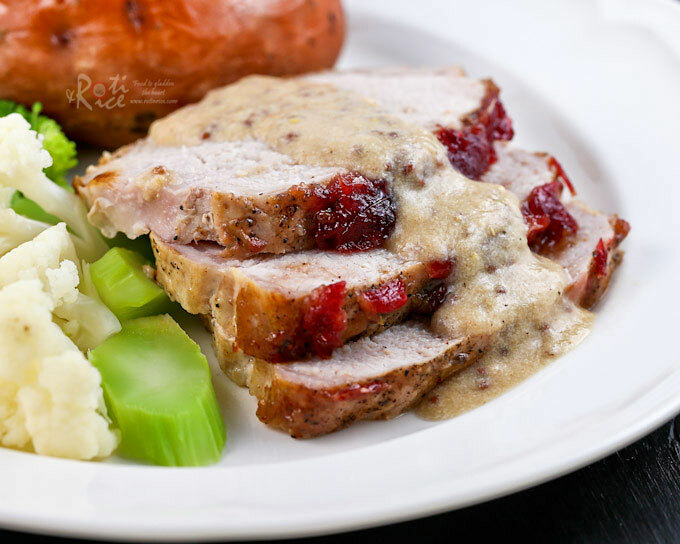 Remove and allow pork loin to rest for 10 minutes before carving and serving with creamy horseradish sauce. Melt butter in a small saucepan. Add all-purpose flour. Stir for 2 to 3 minutes until light brown. Pour in milk whisking vigorously to dissolve the flour into the milk until smooth. Stir in Dijon mustard, salt, and pepper. Cook until sauce is thick and bubbly. Turn off stove. Always allow the roast to rest for about 10 minutes before cutting and serving. In the meantime, you can set the table with the side dishes if you are cooking just for the family. 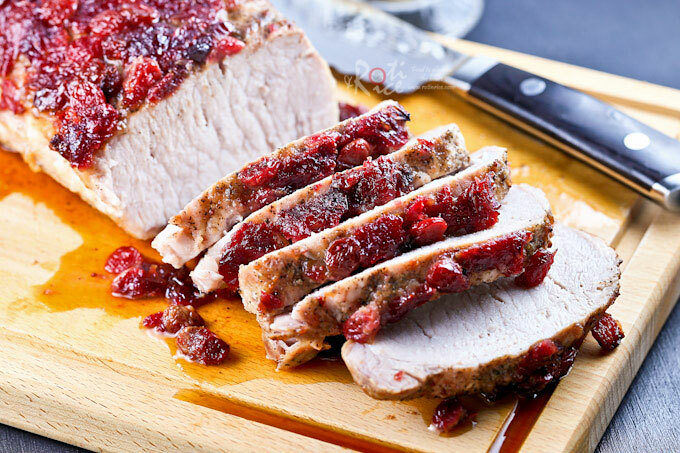 Once that is done, your Cranberry Sauce Pork Loin Roast should be ready for carving. Cut the roast into half inch thick slices and dinner is ready to be served. Place two or three slices on a plate and drizzle some of that Creamy Dijon Mustard Sauce over the top. Now, doesn’t that look like a delicious dinner? I hope you’ll give it a try.